The U.S. Department of the Treasury (Treasury) recently released its long-awaited review of the determination and designation processes of the Financial Stability Oversight Council (FSOC), created under the Dodd-Frank Wall Street Reform and Consumer Protection Act, and its activities related to identifying so-called systemically important financial institutions (SIFIs). 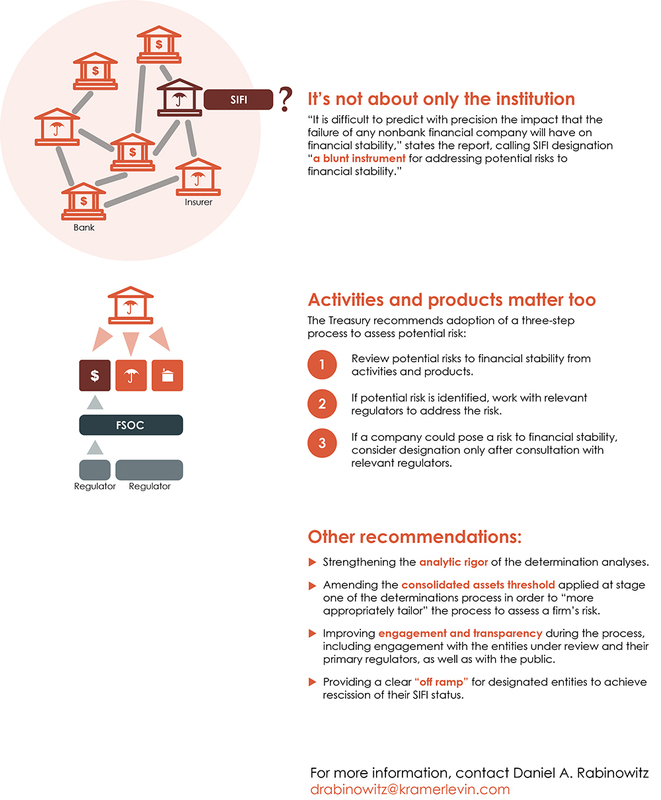 Significantly, among the report’s recommendations is a shift away from the designation of specific nonbank institutions, such as insurance companies, as “systemically important.” Although the report is not binding, its observations offer insight into the Treasury’s vision for regulatory activities and its future plans for the regulation of financial markets. The report was prepared and released in response to President Donald Trump’s April 21, 2017, memorandum to Treasury Secretary Steven Mnuchin requesting a review of FSOC’s process of determining SIFI status. Part of the White House’s overall efforts to streamline and reduce regulations across all federal departments and agencies, the memorandum stated that SIFI designations “have serious implications for affected entities, the industries in which they operate, and the economy at large.” While the White House emphasized the importance of ensuring these processes “promote market discipline and reduce systemic risk,” it also asked the Treasury to consider whether affected entities are “afforded due, fair, and appropriately transparent process” while their SIFI status is determined. Specifically, it requested an assessment of the transparency, due process, impact on moral hazard, costs and benefits, predesignation opportunities for firms to de-risk, and post-designation opportunities for re-evaluation. Within that mandate, the Treasury completed its review and, on Nov. 17, released the report, which evaluates and provides recommendations regarding FSOC’s process both for determining if nonbank financial companies shall be designated and supervised as SIFIs and for designating financial market utilities (FMUs), such as clearinghouses and settlement firms, as systemically important. In regards to nonbank financial companies, the Treasury said it heard several “significant criticisms” from industry stakeholders involving issues such as transparency and the analytical process used to determine each firm’s status. In addition, the report stated that “it is difficult to predict with precision the impact that the failure of any nonbank financial company will have on financial stability” and, as such, indicated it was worth considering whether designating specific firms as “systemically important” was the appropriate regulatory approach. Instead, the Treasury recommended that FSOC prioritize an activities-based or industrywide approach to potential risks posed by nonbank financial companies, calling SIFI designation “a blunt instrument for addressing potential risks to financial stability.” In its place, the Treasury recommends adoption of a three-step process to assess potential risk: i) review potential risks to financial stability from activities and products; ii) if potential risk is identified, work with relevant regulators to address the risk; and iii) if a company could pose a risk to financial stability, consider designation only after consultation with relevant regulators. This model would allow for greater input from specific market regulators and provide affected firms with the ability to address potential risks, while shifting FSOC toward a broader focus on overall market risk. The recommendation will likely be welcomed by the insurance and investment management industries, which have argued that their firms do not pose systemic risks similar to those posed by banks, and have complained about the regulatory burdens that accompany SIFI designation. Few nonbank entities have received SIFI designation, and even fewer such designations remain in effect. Prudential Financial remains the only insurance company with an active, unchallenged SIFI designation, with MetLife contesting its own SIFI status in federal court (and the government’s appeal stayed pending the release of the Treasury’s report) and American International Group’s designation being revoked in September 2017. Strengthening the “analytic rigor” of the determination analyses. Amending the consolidated assets threshold it applies at stage one of its determination process from the current $50 billion, in order to “more appropriately tailor” it to assess a firm’s risk. Improving engagement and transparency during the determination process, including engagement with the entities under review and their primary regulators, as well as with the public. Providing a clear “off ramp” for designated entities to achieve rescission of their SIFI status. In addition, the Treasury recommends that significant issues related to FMU operation, designation and resolution be examined further. These include the Federal Reserve’s authority under Dodd-Frank to maintain an account for a designated FMU and an FMU’s access to the Federal Reserve’s discount window lending, which can be perceived as giving these institutions a market advantage. It is instructive to view the Report in the context of the Trump administration’s frequent criticisms of Dodd-Frank. For example, the administration hailed the House of Representatives’ June 2017 passage of the Financial CHOICE Act, which repeals portions of the law, including a number of the systemic-risk provisions at the heart of the statute. While the ultimate outcome of the legislation is in doubt this election year, the November Treasury Report illuminates the Administration’s likely approach should these provisions survive in their current form.